I've never worn Poison but always admired it on others, so I swapped for a bottle on MUA not long ago. There is a horrid grape Koolade note on me that I really can't stand. Maybe it's been reformulated? The whole nose thing is more of an annoyance than anything else. I think it's like getting cataracts or something, except I'm just going to have to live with it. I can still smell things; it's just that they're changed, sometimes. Even someone walking past me wearing the wrong perfume can send that scent element up my nose, and then that's it for a while--it's almost all I can smell. But it's not always there, fortunately, and some of my favourite new scents and old standbys are still unaltered by this new scent universe I'm forced to inhabit. As for Poison, I would imagine it's been reformulated over the years; virtually everything is, sooner or later, it seems, as ingredients become expensive or medically suspect. This is nothing new: lots of the original synthetic musks are no longer considered safe for human use, and nobody uses unadulterated bergamot because it can stain your skin brown if exposed to sunlight. A lot of people find that vivid purple-fruit note in Poison objectionable. It was never particularly overwhelming on me; it sat primarily in the top notes and was very pleasant. Mostly I got a sweet, spicy, ambery concoction that worked really well on my skin (which thrives on dark oriental scents, though I have very pale skin, which supposedly--ridiculously--is thought to mean you can't wear dark scents but must stick to fresh ones). At least I used to get that scent from it: now there's that note. The aspect of Poison that you (and others) think of as grape Kool-Aid is from an aroma-chemical called beta damascone, which (theoretically, and not to you) smells of blackberries, honey, and warm oriental notes. (Poison actually uses an offshoot of beta damscone called Damascenone, which supposedly smells of roses, grapes, plums, and sugared raspberries.) Beta damascone was a mainstay of mid- to late-eighties perfumery, and it's also found in large quantities in Montana Parfum D'elle, which I also must write about some day. 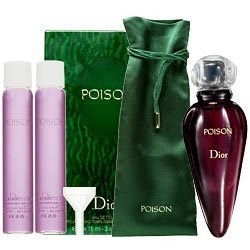 Unfortunately, the only version of Poison still on the market is the EDT, which is the least wonderful of the three versions they launched. There was at the outset an Esprit de Parfum which was richer and lusher, and a few years later came an Eau de Cologne which was brilliant--fresh and light, with the essential character of the scent remaining while the heavy, potentially cloying aspects were minimized. They're both long gone, though you can buy the Esprit online at some stores. You probably wouldn't, not without trying it first, but it really was a better scent than the EDT. It's worth remembering how extraordinarily subjective the sense of smell is. Luca Turin loved Paco Rabanne's La Nuit, but it's one of only two scents in living memory that actually made me recoil from the tester (the other was Lancome's Miracle). One man's must-have is another woman's get-away-from-me. I didn't smell any Play-Doh notes. The top notes smell like coconut and pineapple on me. The whole drydown retains the same tropical / piña colada feel. I certainly do apologize for not having posted anything in a whole month, and I feel bad about it, but there's a reason. It's not for lack of trying! In the last few weeks I've written bits and pieces about the following scents: Phat Farm Atman, Chanel Allure Sensuelle, Azzaro Pour Homme, Amouage Dia Pour Homme, CSP Bois de Filao, YSL M7, and Miller et Berteau Green, green, green and green. I expect there are others that I've forgotten in the interim. I do what I always do: I put on a scent, sniff it, think about it, sniff it some more, write down some ideas, do a little research, sniff yet again, write some more. Eventually the thing gets written. But there's something wrong. There's something wrong with my nose. It's been building for about six months, I suppose. I ordered some things from Sephora about a year and a half ago, and one of them was Poison, the fantastic limited-edition Amulet bottle. I had worn Poison for years not long after it came out; it suited me incredibly well (I intend to write about it properly one day, as I promised a few months ago), but I hadn't had any for quite a while, and I just couldn't resist that amazing bottle, which looks like a lethal dagger made of amethyst. See? I put it away and didn't try it for a whole year, which I do sometimes. A lot of the time, actually: I have at least thirty things--mostly miniatures, but a few full-sized bottles--which I have never opened, and don't get me started on the samples. When I broke it out last summer, I was shocked to discover that it didn't smell at all the way I remembered it: at the very top was a sharp, greenish, synthetic note that I was quite sure hadn't been there originally. I thought the bottle must have gone off, so I went to a department store to try their tester, and it had exactly the same note at the top; something disagreeable and in-the-way. A couple of months later I got a sample, and that smelled the same way, too. What was the story? Was that note there all along, with me simply incapable of smelling it? Was the formula changed? Whatever's going on, it's not just Poison. 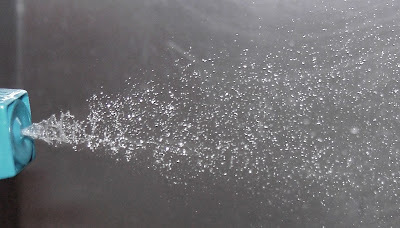 There seems to be something (or somethings) in a lot of commercial scents, and soaps and lotions and the like, which I was never aware of before, but which now simply leaps up at me. It's the dominant scent in anything which contains it, and worse, it takes up lodging in my nostrils and it won't go away; it seems to stick in my nose, and for hours it overlays nearly everything I smell. I'm not "allergic" or "sensitive" to synthetic fragrances, but there is something in some of them--a lot of them--that suddenly is omnipresent: it launches itself at me and it won't let go. It's like trying to watch television and, every now and then, your eyelids take on a life of their own and flap and flutter and get in the way. You can still see the television, but what you're seeing is distorted and diminished. It's not inevitable, it's not everywhere, and it's not predictable. One day last week before work I put on a couple of shots of Coup de Fouet, and it smelled as it ought to. As I sat down at my computer about twelve hours later (it was a long day), at 1:30 in the morning, I put the back of my hand to my nose, and the long-lasting drydown smelled as it ought to, too. My nose isn't permanently busted, at least not yet. But if I had smelled something with that element in it, the CdF would have been ruined for a while, maybe for the rest of the day. Something's going on, and it's really a drag. I have somehow been wrecked by modern perfumery. With any luck, I can still get enough proper nose time to write about the things I love. Keep tuning in.